Pickup bed campers, once a common a sight on American roads, have all but disappeared from our automotive landscape. One American company, Kimbo, aims to turn back the clock. Kimbo Campers, out of Bellingham, Washington, started as a labor of love for Mark King, whose passion for the great outdoors and simple living shaped his dream for a lightweight, space-optimized truck bed camper for the 21st century. King also draws inspiration from nuclear submarines, whose compact living quarters were all too familiar to his father, a former captain of the USS Alabama (SSBN-731). After spending some time living in a 19' Airstream, he thought he could make do with less, and set about building the ultimate compact camper. That Airstream inspiration is very evident, especially in this YouTube video from Down2Mob Overland, who pores over the camper in great detail. Just four have been produced so far, and the subject of this video is the very first one. The campers, weighing a svelte 1,100 pounds, start at $16,000, and go up from there depending on interior equipment. 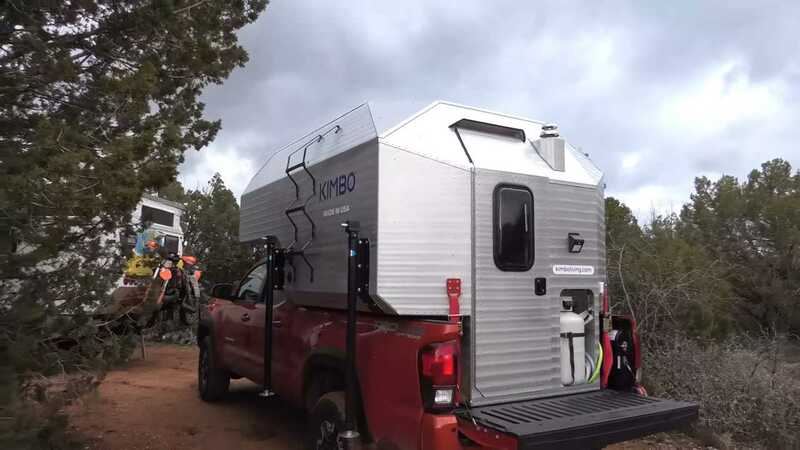 As shown in the video, the Kimbo camper set the buyer back $23,000. That is, of course, not including the Toyota Tacoma base vehicle. The camper appears roomy and almost luxurious inside, filled with high-quality materials and appliances fitted to make the best use of the available space. Amazingly, the stock tailgate is able to be retained, creating something of a front porch for your new living quarters. There's plenty of space to stand up comfortably inside, and even a propane stove for heat and counter space for food prep. Apparently, King believes that roughing it doesn't have to be rough. We're inclined to agree.